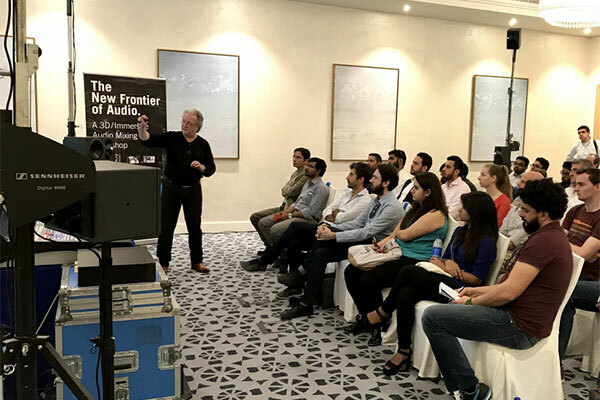 Audio leaders Sennheiser, Dolby, Neumann and Lawo recently conducted the region’s first workshop dedicated to 3D audio capture, processing and mixing in Dubai, UAE. The overwhelmingly positive reception and flood of early registrations prompted the extension of the capacity for the second workshop to accommodate all attendees. Each full-day workshop featured sessions on capturing sound in 3D, mixing, controlling and monitoring immersive sound formats, and establishing efficient encoding workflows for optimum results. Also included were listening sessions designed to expose attendees to audio content originally recorded in 3D as well as recordings upmixed using Sennheiser's patented algorithm. Attendees were also introduced to 3D and object based audio formats – Ambeo by Sennheiser and Dolby Atmos respectively.